Joel Greene here from Condo Hotel Center. Back in October 2011, I told you about a 25-story, to-be-built residential development in downtown Miami that was pre-selling its condos. That was MyBrickell, and it is now sold out, all 192 units, in less than five months. So much for the depressed Miami real estate market! That project was being developed by The Related Group, Miami’s largest vertical condo developer. 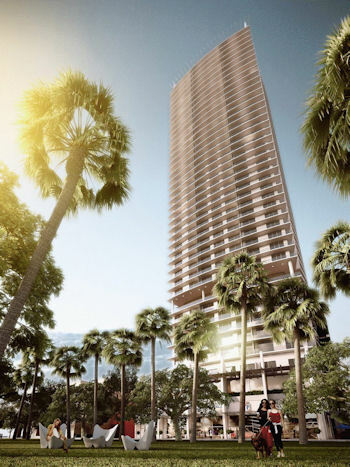 Now, because of the great success at MyBrickell, The Related Group has just announced plans to build a second condo tower in Miami’s prestigious Brickell neighborhood. Like MyBrickell, these condos can be reserved in advance, offering buyers an opportunity to lock in pre-construction prices. Read on for more details. 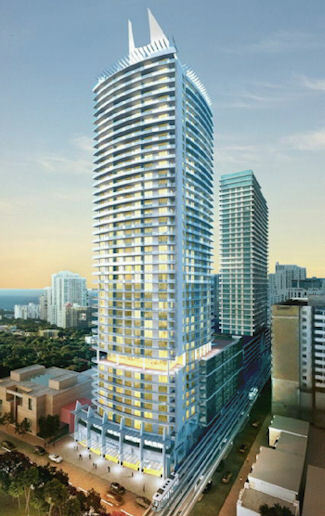 1100 Millecento will be located in the popular Brickell area of downtown Miami. If you’re interested in owning a Miami condo and renting it out, let me provide some of the relevant data. 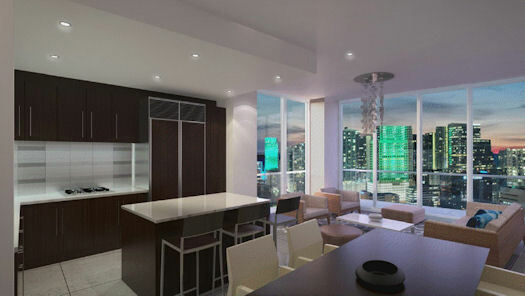 Approximate rental rates in the Brickell area range between $2.00 & $2.50 per sq. ft. On average, rents in the Brickell area have grown 10% annually since 2008 due to a) people moving to Brickell and, b) new office jobs created in the area. 1100 Millecento will be close to stores, restaurants and the businesses of Miami’s thriving financial district. 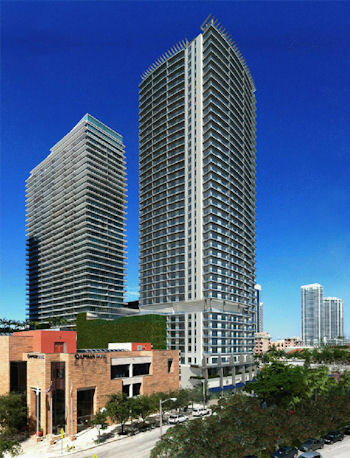 Additional demand will be created when Brickell Financial Plaza opens in 2012. It will have 400,000 square feet and approximately 4,000 people, many of whom will likely want the convenience of living close to their workplace. In the heart of Miami’s financial district, the Brickell area is one of the most happening locales in the city. It’s a great place to vacation or reside and is considered Miami’s business hub. The area also offers fine dining, shopping, live entertainment and cultural attractions. 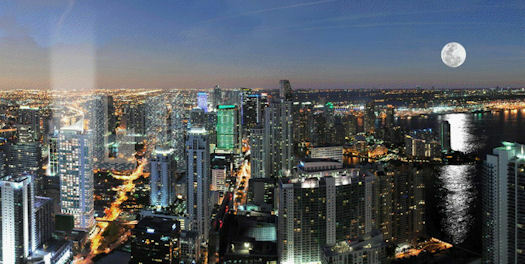 Brickell is Miami’s most prestigious address. 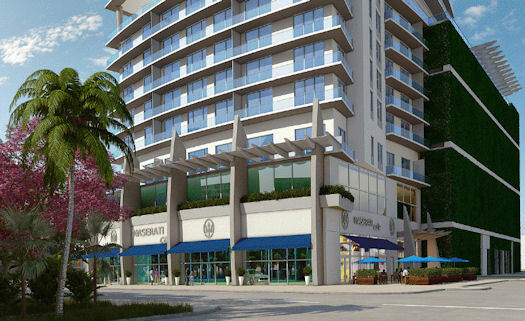 1100 Millecento is just three short blocks from the social hub of Mary Brickell Village with its park-like setting, community center, designer stores, specialty retailers, restaurants, cafes and bars as well as large anchors including Publix grocery store, LA Fitness, PF Changs and more. Artist’s rendering of the Miami skyline view from 1100 Millecento. 1100 Millecento will be just 10-15 minutes to Miami International Airport, beautiful Key Biscayne and exciting South Beach. It’s also less than 10 minutes from the new Performing Art Center, Bayside Marketplace and American Airlines Arena. It offers easy access to the Metro Mover and Metro Rail with service to South Miami, the business districts in Greater Miami and a line currently under construction known as the Airport Link to Miami International Airport. Brickell CitiCenter has already been approved by the City of Miami. Construction is expected to start by June with completion anticipated by 2015. Jorge M. Pérez is the founder of The Related Group, the largest Hispanic-owned business in the U.S. It has a development portfolio of projects worth in excess of $10 billion and the distinction of having been the number one multi-family developer in the nation. Since its inception, more than 30 years ago, the firm has built and/or managed more than 80,000 apartments and condominium residences. Under the direction of Pérez, The Related Group has redefined the South Florida landscape. 1100 Millecento is just one of about a dozen developments they have in Miami and Miami Beach along with other very successful projects like the Icon Brickell, Viceroy Hotel, 50 Biscayne and The Yacht Club. Ground breaking for 1100 Millecento is scheduled for September 2012 with completion of the property expected by November 2014. The condos can be reserved now at pre-construction pricing. The residences will feature open concept contemporary floor plans. A 10% deposit holds a unit until contracts are ready, expected to be July 2012, when an additional 10% deposit is due. Additional monies are due at various stages of construction and completion. 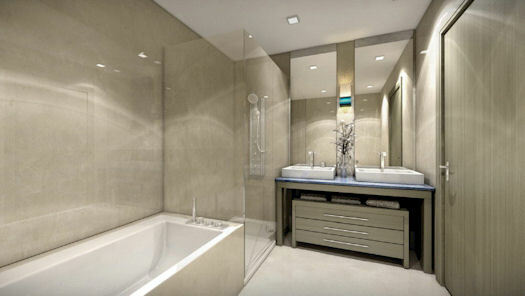 The condo bathrooms will feature European-style cabinetry and imported stone countertops. 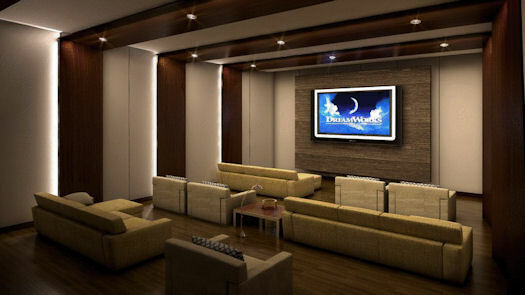 Condos can be reserved at pre-construction pricing now. Available are studios and one- and two-bedroom units, ranging from 578 to 1,270 square feet. Prices start at $226,000 and go up to $550,000. 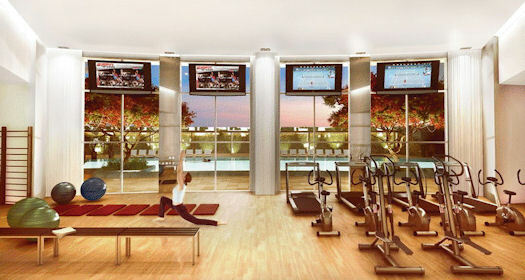 1100 Millecento will offer resort-like amenities including a health spa, fitness center, swimming pools and sun decks. Want more information? I have plenty. I’ve put together a detailed data sheet. Just provide your name and contact information required by the developer at the link below, and we’ll get that right to you. Request the 1100 Millecento data sheet here. Pre-construction prices on 1100 Millecento range from $226,000-$550,000. I’m excited to see all the activity that’s going on in downtown Miami, of which 1100 Millecento is just one small part. Part of the attraction is lower real estate prices, down from the market’s peak years, but all the activity, development and jobs in the area are also a big part of it. The signs are very positive, very encouraging. Miami has so much to offer. It’s nice to once again see this part of the world on the upswing. As always, thank you for your interest in the properties we showcase at Condo Hotel Center. If you’d like to see what else we have available, check out our Featured Properties.